Islamic art is a 19th century category given by art historians to art created by Islamic peoples living mainly in the Arabian peninsula, but in other countries that were ruled for a period by Islamic rulers. 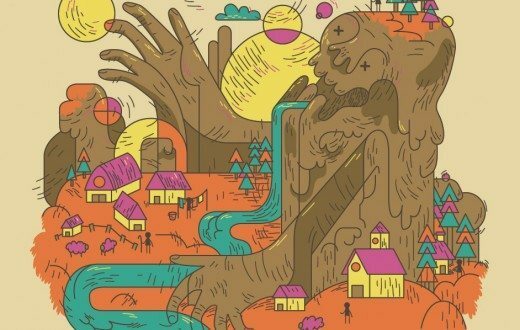 This is not to be confused with art that was created under the religion of Islam; it refers to the art by and for any religion that was created in lands whose dominant religion happened to Islam. The history of Islamic expansion is quite detailed and extensive and is a lengthy subject on its own. The beginnings of Islamic art are hard to distinguish from those of existing cultures at the time of the birth of Islam, but it is known that plant motifs were popular. Oriental carpets are known the world over as one of the greatest achievements of Islamic art and they are as popular today as they were in their inception. They are used in the religious practices of Muslims, and in the homes of people of other religions or no religion. The same patterns and techniques are not confined to rugs, but too many forms of textile from cushions to wall coverings and even as table cloths. While many representational copies are machine made now, true Oriental carpets are hand woven or hand loomed in intricate designs in an array of bright colors. 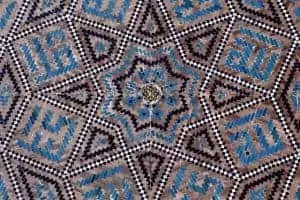 Islamic artistry in architecture is not known only for domed ceilings and great works like the Dome of the Rock or the Taj Mahal, but for the rich mosaics and tile work within them. Mosaic and tile art were influenced by the mosaics of the Byzantine period and led to a centuries long practice of crafting glazed tiles in bright and vivid colors, and a later technique of painting tiles before firing. Some tiles are molded in relief to depict lettering, animals, or human figures and are part of a cohesive design that included other tiles shaped as stars that appeared intermittently amongst the reliefs. Another form of tiling, so to speak, was the preference of the Mughals to use parchin kari. This technique used semi-precious stones and jewels on inlaid panels, and often depicted naturalistic elements such as florals. Examples can be seen at the Taj Mahal. 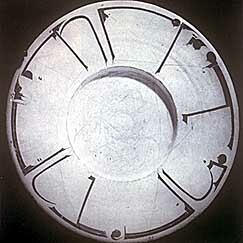 Calligraphic trends in Islamic art include Quranic Art (calligraphy in painting or sculpture), Epigraphic Ware (inscriptions on pottery), Kufic and Naskh scripts (written on ceilings and domes), religious sayings on smaller secular objects (coins, small paintings, metalwork, and buildings), and the tughra of Ottomon Sultans (monograms). Calligraphy was also used in texts, such as short poems or books of poetry, or on single sheets containing Qu’ranic verses. The language of the calligraphy depended upon location and would be one of four: Arabic, Persian, Turkish, or Urdu. 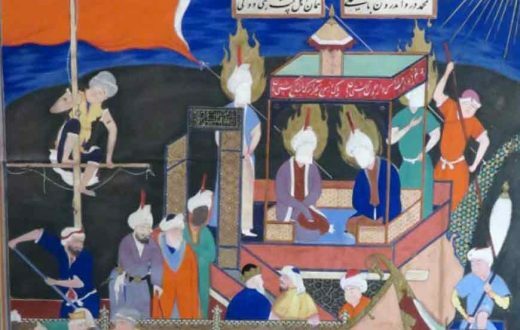 Miniature paintings and illuminated manuscripts were amongst the highest achievements in visual art within Islamic nations. Persian miniatures were a courtly art and they had great influence of the art of miniatures in other nations. Compositions held more figures than previously seen, or seen outside the court, and subjects were free to be more secular in nature and more relaxed. Illuminated manuscripts were not confined to religious texts and, in fact, the most prolific are dedicated to Persian poetry. 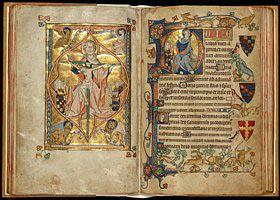 Other subjects included autobiographies of rulers and military engagements. Later Chinese influence led to a different viewing perspective so that background scenes in illuminated illustrations show distance, scale, and height. 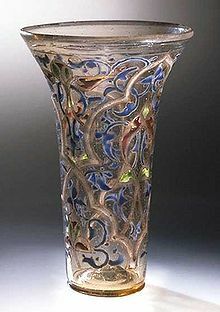 Islamic glass was the most prized glass of its day and was an object of desire for both the Chinese and the Europeans. This highly prized glass was decorated in relief and etching, or was created from carved quartz crystal. Some glass makers used color on smooth pieces. Even though this art is referred to as Islamic, the inclusion of secular elements and their forbiddance by Islamic clergy is testament to this not actually being a religious art movement. Calligraphers were the most cherished artists and were higher in the social strata than other types of artists. The Hadiths forbade drinking or eating from vessels forged in gold or silver and also forbade the wearing of gold rings. Miniatures were often collected in albums. Scenes of picnics, animals, idealized male and female figures, or portraits featured prominently.